Liberty Bell. National Park Service. The line from the King James Bible is near the top of the bell. Perhaps the most surprising fact about the Liberty Bell is that it was first cast many years before the American Revolution, in 1751—not in 1776, as one might assume. Pennsylvania’s colonial assembly ordered a bell for its state house, specifying that the London company making the bell place on it a passage from the King James Bible, Leviticus 25:10: “Proclaim LIBERTY throughout all the Land unto all the Inhabitants thereof.” That phrase was apparently a reference to the liberties established in the Pennsylvania colony by its Quaker founder William Penn, including religious freedom and the powers of the legislative assembly. Anti-slavery advocates later gave the Liberty Bell its name based on the biblical words, and used it as an abolitionist symbol starting in the 1830s. 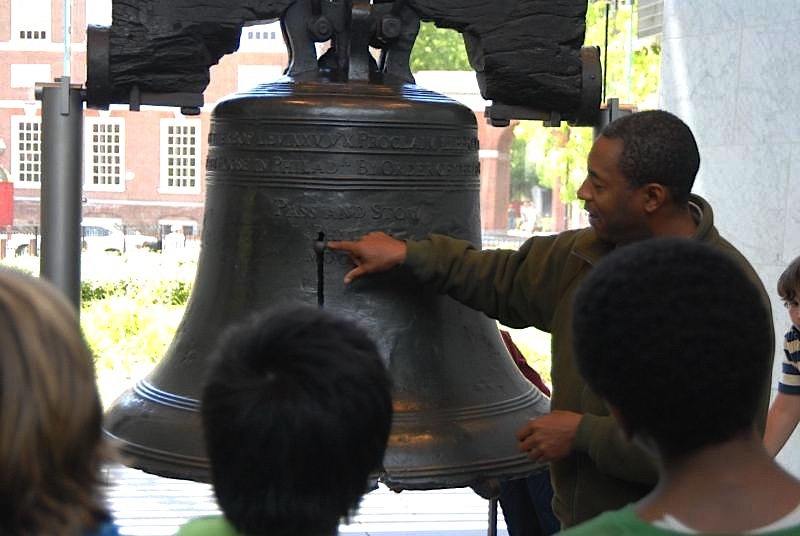 As explained by the National Park Service, the first bell cracked almost immediately after it reached Philadelphia. The same metal was used to cast a second bell, with the same biblical language, in 1753. That one—the bell we know today—lasted until 1846, when a crack appeared and another followed, retiring it from service. What would the Liberty Bell sound like if it had never cracked? For that matter, what would it sound like if it were rung today, as-is? Thanks to a computer model described in this article on a National Park Service website, you can hear it for yourself. Just select the audio links for the “unbroken” or “cracked” Liberty Bell. Manifold Greatness: The Creation and Afterlife of the King James Bible, is a joint project of the Folger Shakespeare Library in Washington, DC, and the Bodleian Library of Oxford University, with assistance from the Harry Ransom Center of the University of Texas at Austin, that marked the 400th anniversary of the 1611 King James Bible. A traveling exhibit to 40 libraries around the United States is now at the 40th library, the Nancy Guinn Memorial Library in Conyers, Georgia, through next Friday, July 12. Manifold Greatness also includes an extensive website with image galleries, original videos, interactive timelines, and more. This entry was posted on July 4, 2013 by manifoldgreatness. It was filed under Influences and was tagged with abolitionists, Fourth of July, King James Bible, Liberty Bell, Philadelphia.